Centrally located just 100 metres from the Piazza San Pietro, this apartment will allow you to reach the most important historical, artistic and shopping areas of the city in no time at all. 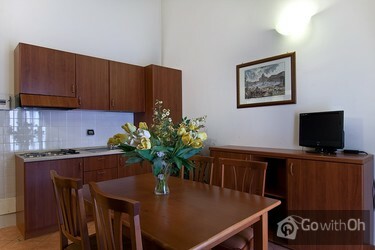 It is located in a new building, built in 2001, and features a kitchen, equipped with coffee pot and fridge, and satellite TV. The apartment is furnished with, amongst other things, a large wardrobe, comfortable sofa beds and armchairs, and bright wallpaper which makes the place feel more comfortable. 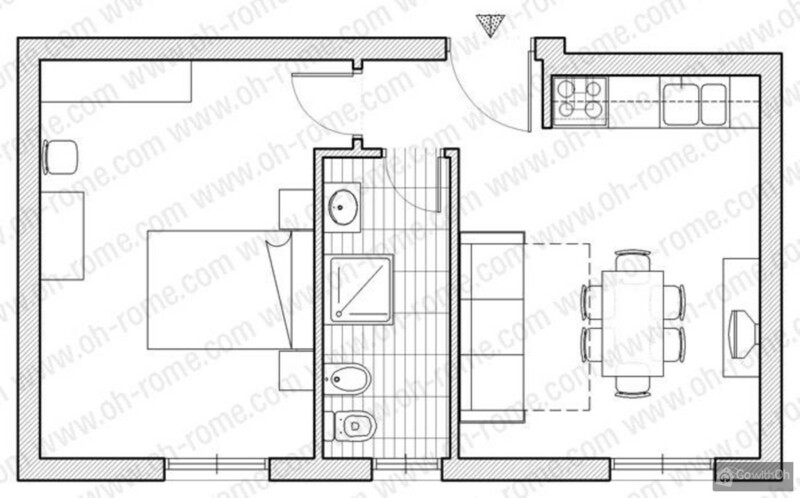 The living room, which is spacious and comfortable, includes a dining area with a kitchenette and an area with a double bed and two armchairs. The bathroom features a shower. Despite the simple, traditional style of the building, the fact that is has a patio and garden area with private access makes it an extremely peaceful and quiet place to stay. Note that there is also a Wi-Fi Internet connection available in the apartment. Access to a private car park for 15 euros a day - Caution: the garage gate is only 2 metres wide. Extra charges: for monthly stays, the cost of utilities (electricity, gas etc.) is calculated at the end of your stay and you will have to pay this amount in cash. Wel wat gehorig. TV had alleen maar Italiaanse zenders. Verder dik tevreden. Die Unterkunft war soweit ok, alles nötige war vorhanden. Die Möbel (Sofa) sind z.T. schon ein bisschen verschlissen, aber insgesamt noch akzeptabel. Sehr gut waren die Matratzen vom Doppelbett, wir haben wunderbar geschlafen. Das gesamte Haus ist sehr hellhörig, jedes kleinste Stuhlschieben der ...anderen Wohnungen war deutlich hörbar. Aber von der Strasse hört man so gut wie garnichts, es ist wirklich sehr ruhig und doch sehr zentral (nahe dem Petersdom). Die Vermittlung war aufmerksam; unsere Nachfragen wurden prompt beantwortet. Muy buena atención . Todo estuvo bien , no tengo quejas. Für 3 Erwachsene und 1 Kind (11) war die Wohnung bestens geeignet. Lage optimal, Bus zur Piazza Venezia vor der Tür, zur U-Bahn ca. 10 Minuten zu Fuß. Aber auch sonst alles gut zu erreichen. Bäckerei etc. vor der Tür, größerer Supermarkt 5 Minuten zu Fuß. Ein bißchen Küchengerät ...(Kaffeemaschine z.B.) sollte man schon mitnehmen. Kontaktperson(en) für Auskünfte und kleinere Hilfen immer ansprechbar und hilfsbereit. 2 kleine Kritikpunkte sollten aber nicht unerwähnt bleiben: - in der Beschreibung stand, daß der Tiefgaragenplatz fest im Preis bezahlt werden müsse, egal ob man mit oder ohne Auto anreisen würde. U.a. deswegen hatten wir uns auch für das Auto entschieden, und mussten trotzdem den Platz nochmals extra zahlen (?). - bei der Abreise wurden wir von einem Anwohner in der Tiefgarage so zugeparkt, daß wir mit Volvo V40 kaum vom Standplatz rückwärts rangieren konnten. Nach 20 Minuten Kurbelei und mm-Arbeit war es dann geschafft. Obwohl man nur mit Schlüssel in die Garage kommt und daher der Fahrer aus dem Haus kommen musste, war die damalige Kontaktperson sichtlich mit der Situation überfordert um nicht zu sagen hilflos. Egal, ich kann die Wohnung nur empfehlen und würde sofort wieder dort absteigen. Bin zwar mit solchen Portalen bei Erstnutzungen immer vorsichtig. Mit Mail und auch Telefon aber inhaltlich optimal und auch zeitnah beraten. Kann daher wirklich nur Gutes sagen. Die Unterkunft und die Betreuung vor Ort erwies sich als besser, als wir erwartet hatten. Grosses Lob besonders an die freundliche Dame an der Rezeption für die gute Anreisebeschreibung und Empfehlungen für Besichtigungen vor Ort. I wanted an apartment close to the central part of Rome, allowing me to get up in my own time to explore Rome from there. 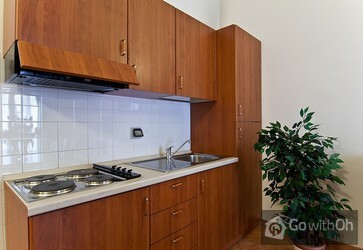 This apartment, close to the Vatican and in walking-distance from the Ottaviano subway station provided just that. Also the location was perfect for starting walks down the Tiber... or into the Historical areas and of course it's only a stroll from Trastevere. 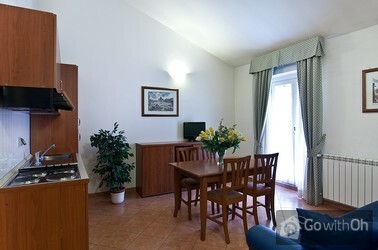 Fantastic location and great apartment! With windows open you can hear surrounding sounds, but that didn't bother me in the least. Die Wohnung war super. Nur die Ausklappcouch war ein wenig unbequem. Die Kontaktperson ist sehr freundlich und flexibel, Wir konnten bereits früh morgens in die Wohnung. Silenzioso, dotato di WIFI, pulito e funzionale. Centralissimo, con garage indipendente ma attenzione alle misure dell'auto! Divano letto comodissimo. Da rivedere: la presa dell'antenna TV nel soggiornino. Alla reception ho trovato F, gentilissimo e disponibile. In generale, è un ottimo ...appartamento per un soggiorno breve, medio o lungo nella capitale. Da tenere a mente. Das Appartment war in Ordnung und entsprach der Beschreibung. Allerdings war das Haus recht helhörig, man hörte jedes Wort, das im Treppenhaus gesprochen wurde. 9/10 Nous avons été très bien reçu par la personne de l'accueil (F.). Très compétente. L'appartement est très bien et très propre. La literie est confortable. Juste une petite remarque sur l'insonorisation, au niveau de l'appartement du dessus. Très bonne impression au global. Allez-y, vous êtes à 2 pas du Vatican. El trato con las personas de contacto, ya fuera directamente, por correo electrónico o teléfono ha sido exquisito. No obstante, tengo que decir que respecto a nuestro deseo de disponer de un tostador, algo básico, no se nos ha facilitado. Por lo demás, el apartamento es acogedor y ...suficientemente amplio para dos personas aunque la cabina de ducha es algo pequeña. En cualquier caso, muy recomendable. Die Ferienwohnung, in der wir utergekommen sind, war sehr ruhig, aber doch zentral gelegen und war sehr komfortabel ausgestattet. Vor allem war auch das Badezimmer und die Küche sehr sauber. Wir sind sehr froh diese Ferienwohnung gefunden zu haben! La persona de contacto no fue la pactada, le envié un mail previo a mi llegada pero no lo respondió, luego lo ubiqué por teléfono para pactar la hora de llegada. Nos recibió la otra persona, la Srta.F. quien fue una excelente anfitriona. Die Lage der Wohnung war super.Nah am Bahnhof, ein Supermarkt ist der Nähe, der Petersdom gleich nebenan, ruhig gelegen in einem Hinterhof.Man konnte alles fußläufig besichtigen. Die Wohnung war sehr sauber, ist hübsch eingerichtet und man hat 3 dt. TV Sender. Leider recht hellhörig zu den Nachbarwohnungen. Il proprietario ci ha accolti puntualmente e cordialmente, inoltre ci ha fornito utili informazioni e consigli su come organizzare le nostre visite e su dove assaggiare la cucina tipica locale. 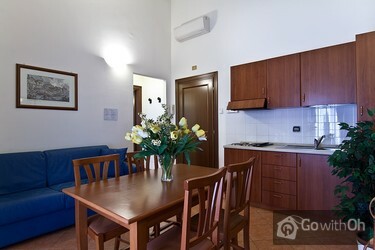 L'appartamento é ubicato a pochi passi da S.Pietro e perfetto per raggiungere a piedi Trastevere, il ...Gianicolo, o le zone di piazza Navona o Campo dei Fiori. Pulizia e funzionalitá a prova di famiglia con bambini Piccoli.